Mint, however well known in the U.S., is by no means a universal culinary flavoring, especially once one leaves sweets and desserts behind. The French despise the herb, the English adore it, the Spanish and the Italians use it somewhat, the cultures of the Middle East and of India use it heavily, and so it goes. One problem with mint is that, as a strong flavor, it mixes well with very few other flavorings; but there are certain foodstuffs that it does complement nicely (it seems to most to work especially well with warm-weather cookery). Another problem with mint as known to most Americans is that it is too strong, because the culinarily superior types are not so well known. But it would be a poor kitchen with no mint available for use at need. Classifying mints is a botanist’s nightmare, for they hybridize with stunning ease (and frequency). There are said to be over two dozen true species, and literally countless hybrids (and botanists are still trying, with genetic research, to sort out which is truly what)—one source refers to over 200 named varieties. One with a bad case of “stamp-collector’s syndrome” could easily end up with a dozen pots of mints and a yearning for more. The key to wise acquisition of a mint plant or plants is to reasonably foresee one’s likely culinary use of the herb. If you adore sweets and regularly make all kinds of them up yourself, what you probably want is not many mint plants but a good-sized bottle of peppermint oil. For dishes other than sweets, opinions vary. Some (for example, Madalene Hill, an expert who even has a mint cultivar named after her) are emphatic in saying ”spearmint” (Mentha spicata is the crown jewel of the mint world, while others (for example, Tom Stobart, author of the definitive book on flavorings) hold that that the milder-tasting applemint (Mentha suaveolens) is premier. One Frances Smith, billed by The Telegraph as “herb grower for, and guru to, London chefs”, has said ”To cook with, the best two [mints] are apple mint and Bowles’ mint, both of which have small, furry leaves you wouldn’t want to eat raw, but which come into their own when cooked.” (But the newspaper, farther down in its article, added spearmint to the list of recommended cooking mint herbs.) Each of those species has numerous cultivars; for example, “pineapple mint” is a cultivar of applemint, as is the aforementioned ”Bowles’ mint”. As to selecting particular cultivars of spearmint and applemint: it’s much as with so many other herbs—choose your herbalist and trust that the plants you get will be good examples and true to type. The very first thing to know is that mints, left to their own devices, are highly invasive, and very difficult to extirpate once established anywhere; it is thus mandatory to restrain their roots (they spread underground), as by growing them in a container (even those who grow them outdoors “in ground” must sink some sort of restrainer—a piece of clay pipe or the like—around the plant to a depth of at least a foot, preferably more for safety). As you might deduce from that note, mint is very easy to grow. Because it hybridizes the way it does, one never grows it from seed, but obtains cuttings from a reliable herbalist. Mint likes full sun but will tolerate some shade. It’s not fussy about soil. Unlike so many other herbs, mint likes it moist, so water it often and well and try not to let the soil get dry (it can survive some drought—it can probably survive a direct nuclear hit—but it does better in moist soil). Also, unlike many other herbs, mint can use some good fertlizing annually; that’s probably best applied in late summer. When harvesting from any mint, the best leaves to use are the top bud and first two leaves; pinch out the growing tip rather than cut a whole stem. Don’t be afraid to cut and prune ruthlessly, even right down to the soil (you can, and perhaps even should, do that a couple of times a year, to keep it from going woody). Use only freshly harvested leaves: mint’s flavor does not well survive attempts to dry or preserve it. 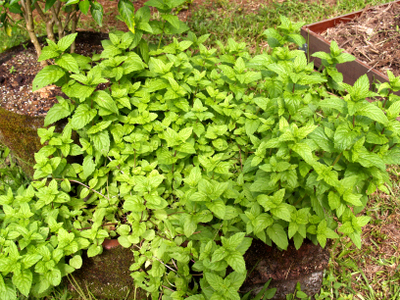 Mint can easily be propagated by division, which can readily be accomplished at any time, though it is probably best done in the spring or autumn to allow the plant to establish more quickly; virtually any part of a root is capable of growing into a new plant, and it doesn’t take much either—1½ inches is enough. Even more so than with many other herbs, it is critical to the culinary use of mint to to add it to a cooked dish only at the very last possible instant; not only do its essential oils vaporize quickly, but it blackens very easily in heat. It was last modified on Monday, 4 February 2019, at 13:11 EST.